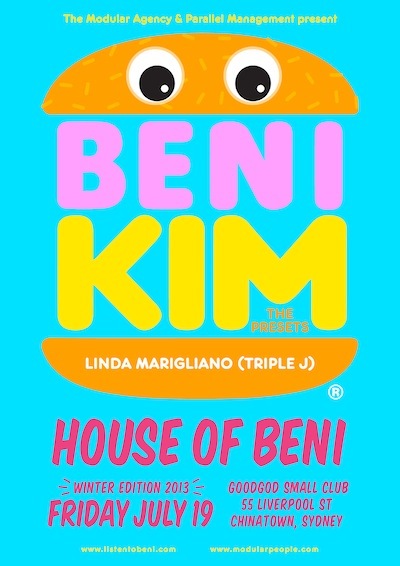 This winter, KIM and Beni join forces to take over the Danceteria! Over three hours of back-to-back DJing, they’ll take you on a journey through some of their latest interests along with their long standing influences, and everything in-between. Joining them at for their exclusive show at Sydney’s Goodgod will be leading lady Linda Marigliano – who’ll be bringing the heat straight after her triple j show! KIM (aka Kim Moyes, one half of The Presets) heads out for his first national DJ run in four years. In that time he’s released ‘Selected Jerks 2001 – 2009′, co-produced, released and toured the critically acclaimed ‘Pacifica’ with The Presets, and lent his production, remix and DJ skills to a wide and varied array of brilliantly talented artists. His DJ sets merge his taste for hard minimal techno and boogie house, with flourishes of the melodic and the popular. Beni’s upbringing in the world of dance saw him burst from the gates with dance vagabonds The Bang Gang DJs and Riot in Belgium. Soon after he headed out on this own with a string of releases on Kitsune, and his acclaimed triple j album of the week ‘House of Beni’, released on Modular and featuring club faves ‘Someone Just Like You’ and ‘It’s a Bubble’. Click here for a new Beni mix!